Towards the end of the 19th Century, as competition forced down prices between professional photographers, so some looked for new markets and for new products beyond the well-known carte de visite, cabinet and postcard formats. Some found a way ahead by introducing "cheap work" developing smaller, less expensive portrait formats, using less material, and marketed these, sometimes as novelties, to those who hitherto may not have been able to afford more traditional photographic products. Some photographers shifted primarily to these products, while others added them to their existing offerings. So we find from around the 1890s to perhaps the 1920s a variety of different offerings and formats of tiny portraits, some with different names, no standard nomenclature, a whole body of work which photo historians have not yet named or considered as a genre. These might be loosely described as a “sub carte-de-visite size formats”. A few of the formats produced did, and still do, have names, and we will first list these before going on to discuss the important "Stickyback" remainder. 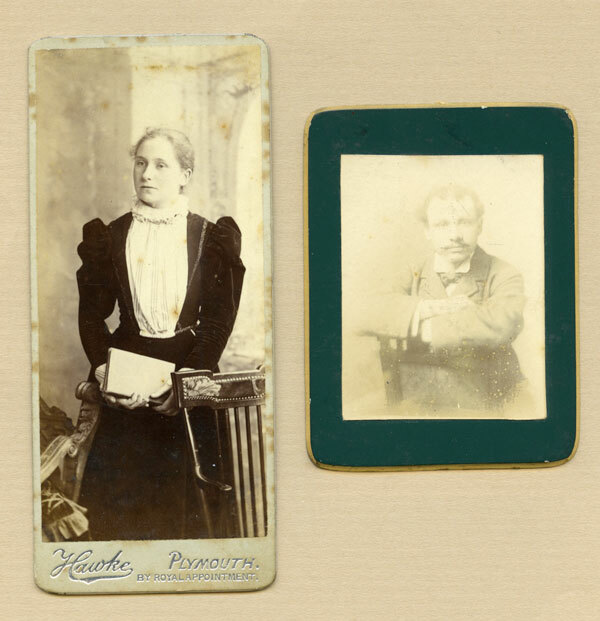 The standard carte de visite was a photograph pasted onto a slightly larger card mount which was approximately 2.5 x 4.15 inches. The mount usually had printed information about the photographer, often within an elaborate graphic design, on either the face or reverse or both. Costs could be reduced by using cheaper mounts, perhaps without any customised printing; by reducing the size of the photograph stuck to the mount; then by reducing the size of the mount itself as well as the size of the photograph. 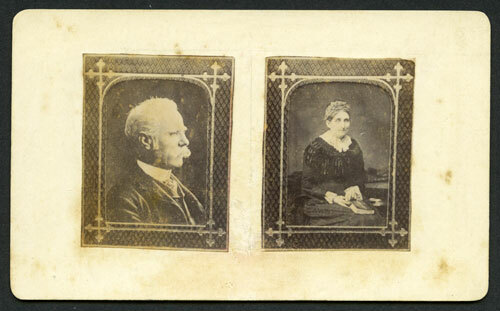 The composite photograph below illustrates these trends - in the top left hand corner is a fairly standard cdv by Gates Brothers, Cambridge. The top row has four other identical sized mounts but with reducing sizes of photographs attached; all four mounts have no printing on the front or rear, but instead bear the photographer's details impressed into the card with a hand embossing machine (the photographers are, left to right, Geo Pendry Nottingham, Geo Pendry Nottingham, J.Kerby and Son Ipswich and Harwich and Frank Hull of New Barnet). All of these top row images would have been sold as "cartes de visite" and would be regarded as such by today's collectors. 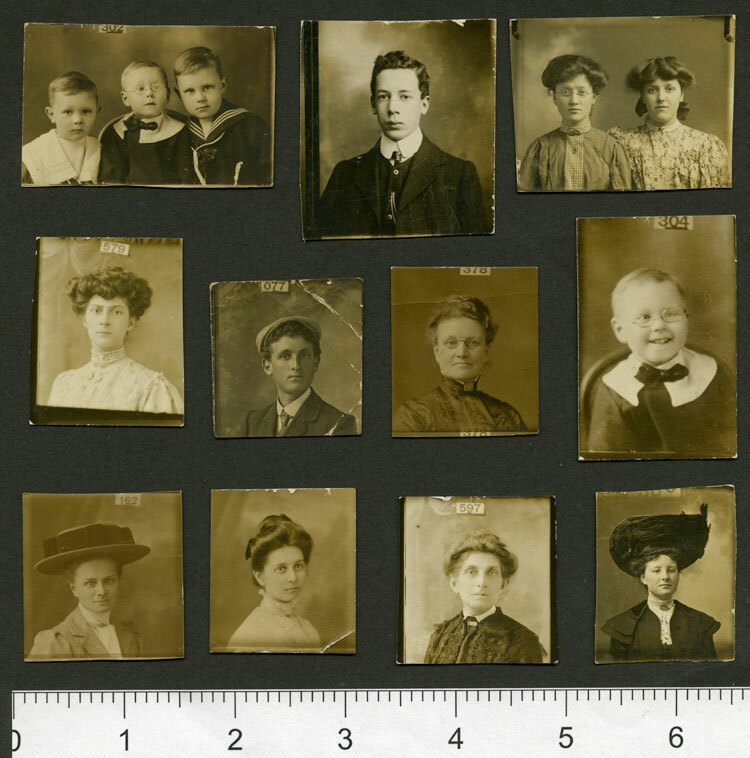 The next two rows show a gradual reduction in the size of both the photographic images and the mounts, the smallest of these is a photograph just 0.85 x 1.2 inches on a mount 2.4 x 2.85 inches (by G Wilson of Grange). Would the photographers concerned have sold these as cartes de visite, or under some other product name? I don't think that today's collector would call these smaller versions "cartes de visite". They are tiny photographic portraits, dressed up as something better and more traditional, by the simple expedient of sticking them onto a cheap card mount. 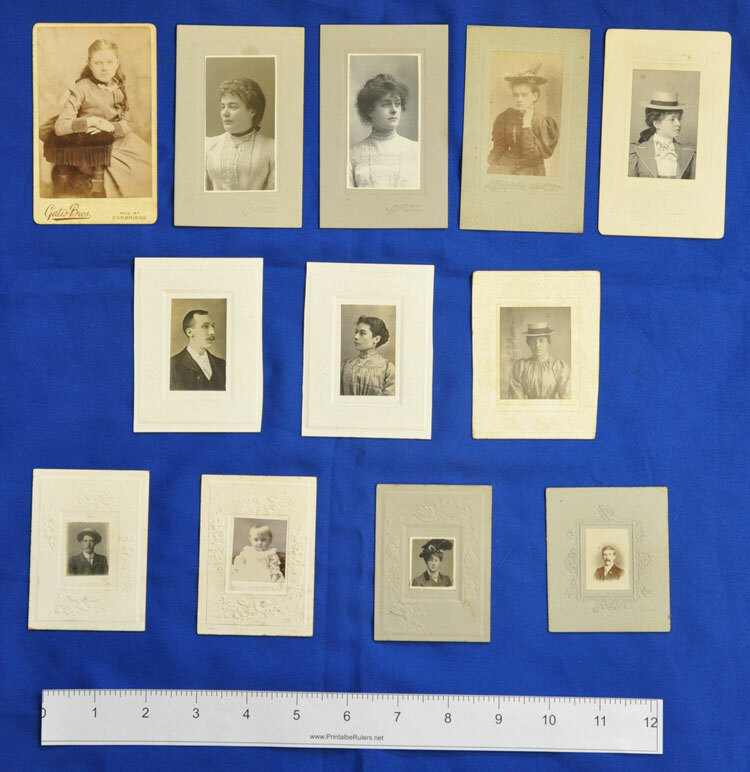 These were novelty photographs, produced postage stamp sized, with a postage stamp like appearance, generally with a portrait within a border and in some cases with perforated edges. The earliest advertisement found for these is from 1863. An example pair of stamp photographs are shown below. 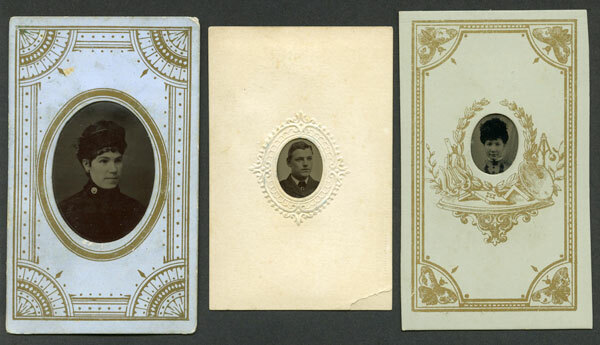 These have, perhaps unusually, been stuck onto a blank carte de visite mount, probably to display them within an album. There is more on stamp photographs on our site here. UK advertisements for midget photographs can be found in newspapers from around 1883, midget cartes de visite from around 1889. The term "Midget" became so widely used that it might have been applied to a whole range of different sizes of smaller prints and mounts. The two images below, from Marion and Co's Photographic Catalogue of 1906, are of two different types of moveable or repeating backs for studio cameras. These replaced the standard plate-holding camera back and were used to expose only a part of the plate each time the shutter was fired. The photographer moved the camera back after each shot to successively expose all the parts of the plate, leaving four or six smaller exposures or more on each plate. The second of these is the more complex, with a round counter on the top and a locking mechanism so that it was not possible to create a double exposure by forgetting which positions on the plate had already been used. This back was patented in 1906 by the photographer George Thomas Bayley (believed to be George Thomas Bailey b.1862 Heavitree Devon, from 3 Union Street, East Stonehouse, Devon) (Patent GB190509729 (A) ― 1906-03-15). 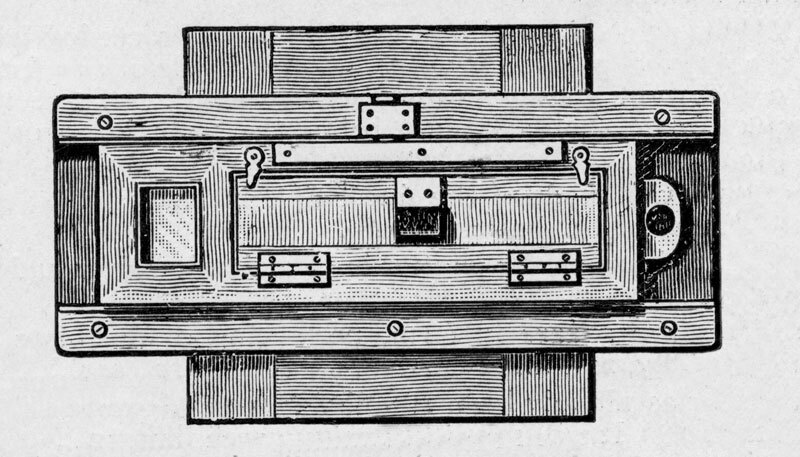 These "midget" repeating backs would produce six images on a half plate, four images on a quarter plate or six images on a quarter plate, landscape or portrait. This would theoretically give a variety of sizes: 1.6 x 1.4 in and 1.4 x 1.09 in and 2.13 x 1.6 in, but, depending on how much overlap or non overlap and trimming of the resultant images, the finished sizes would all be smaller. Marion and Co, repeating midget back, 1906. Marion and Co "Soho" repeating back for stamp and midget photographs. The British Midget, or Midget carte de visite, mount was 15⁄16 x 21⁄4 inches or 3.3 x 5.7cm (according to Cassell's Cyclopedia of Photography, Ed B.Jones, 1911). 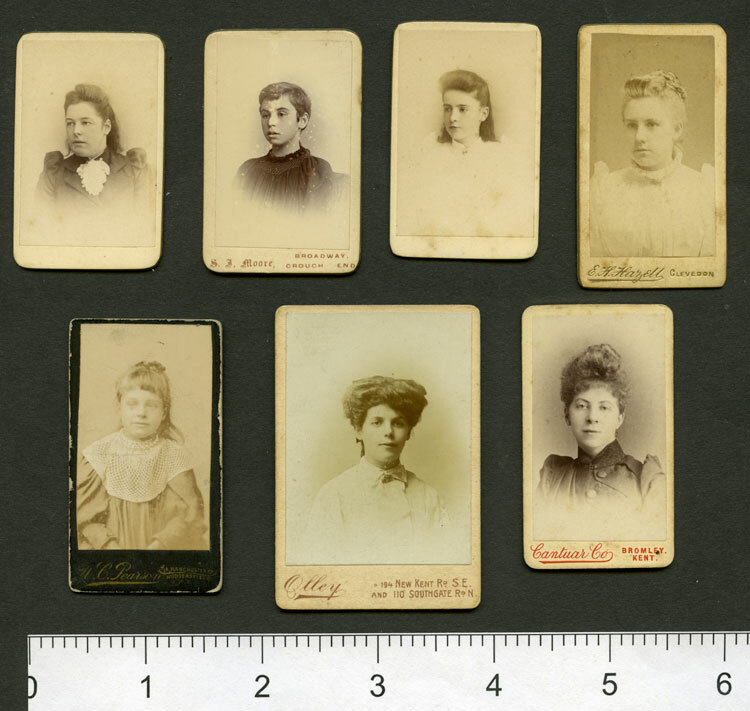 Below is a selection of midget cartes, often with mounts printed on both the face and reverse, and with the overall appearance of a scaled down version of the traditional cdv. Painted miniature portraits were an art form for those who could afford them from the mid 18th century until after the introduction of Daguerreotypes and photography. Some painters of miniature portraits became photographers as photography became established. The word "miniature" seems to have been used as a general descriptive term applied to smaller photographs since the 1850s, for example "miniature photographs to fit in lockets". Today collectors and sellers often refer to "midget" cartes (see above) as "miniature" cartes. However this does not seem to have become the name for any specific sizes or types of photographs or mounts. 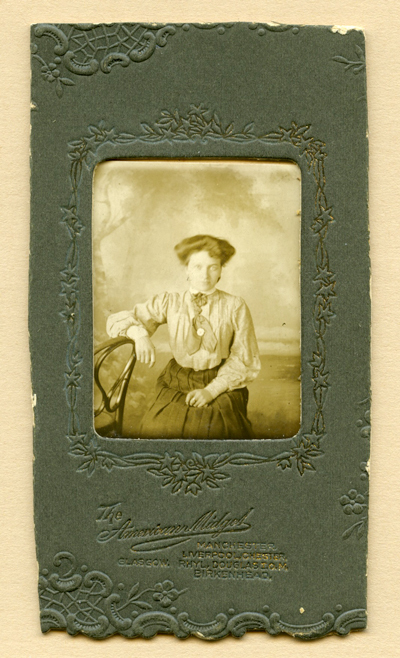 The image below is of a small portrait, about 2 in x 1.5 in, in an ornate embossed card mount 3 in x 2.25 in. 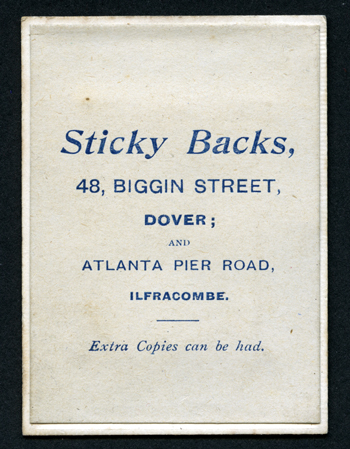 The mount is labeled "The Royal Miniature" and on the reverse is shown the studio - "Sticky Backs, 48 Biggin Street Dover and Atlanta Pier Road Ilfracombe". 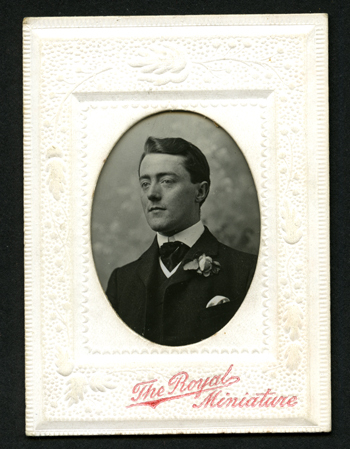 Was "The Royal Miniature" a standard size and type of product or simply a grand name given by a Sticky Back photographer to a mount used for his portraits? 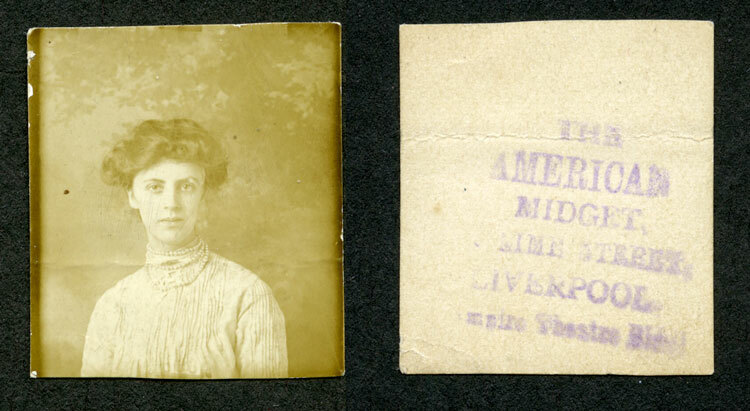 The example below is a portrait measuring just 1.35in x 1.2 in, on flimsy photographic paper, stamped on the reverse "The American Midget, Lime Street, Liverpool". There is a dappled background and the print has faded somewhat. Although this sounds like a format size, it may simply be the name of a Liverpool stickyback studio from the early 1900s. The precise address of this photographer in Lime Street Liverpool is not shown. It is likely that the photographer was American Galleries, 7 Lime Street Liverpool. They were operating from around 1912-1918 and also had studios at Kinmel Camp and 17 High Street, Rhyl, North Wales, and at 259 Argyle Street Glasgow. 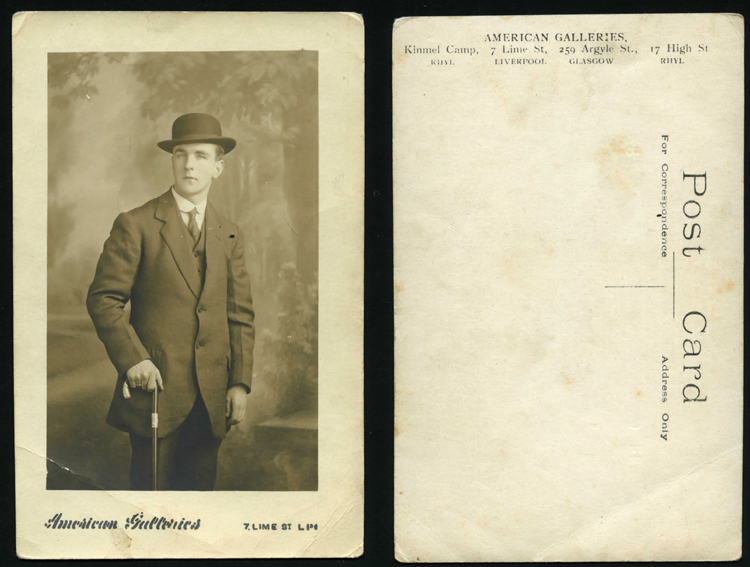 Below is a postcard portrait, by American Galleries, of an unknown gent in bowler hat with walking stick. Below this is another small photograph, 1.5in x 1.9in of a seated lady. This has been inserted into a green embossed mount which bears the legend: "The American Midget, Manchester, Liverpool, Chester, Glasgow, Rhyl, Douglas IOM and Birkenhead." 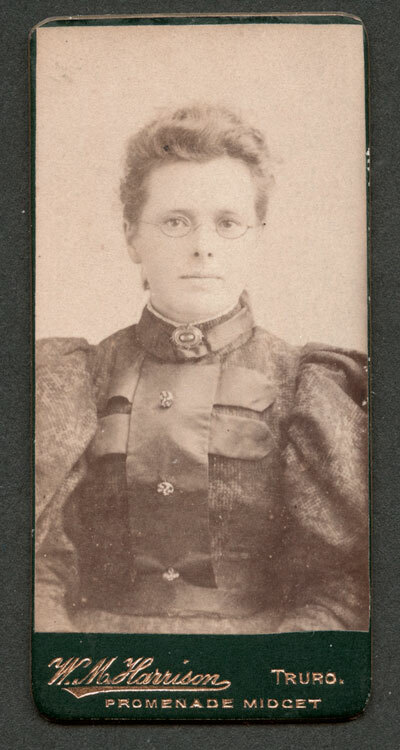 It is impossible to know the original size of the mount as it has been cropped, to approximately carte de visite size, presumably to fit into an album. The aperture in the mount measures 1.4in x 1.9in. The mottled backcloth in these three portraits appears similar. 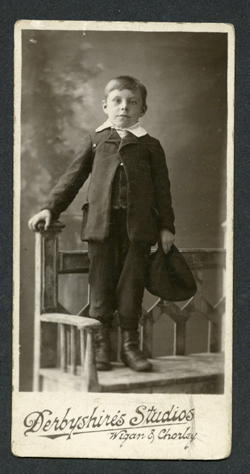 Below is an example of a Promenade Midget carte de visite by W.M.Harrison of Truro. The mount is black card, printed on the face only, with rounded corners and a plain reverse. From the dress of the subject this would appear to date from 1890s. The carte unusually caries the description "PROMENADE MIDGET" on the face of the mount. Its size is 3.2 x 1.55 inches. 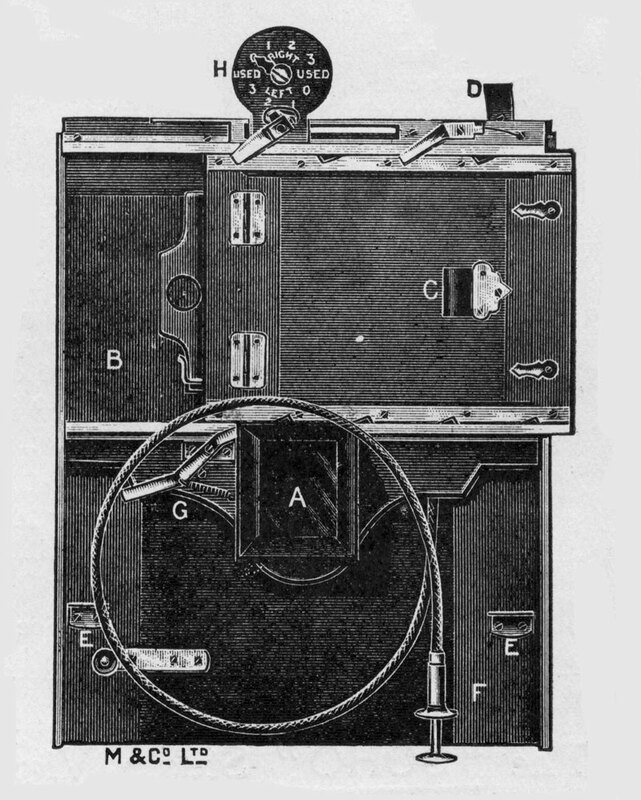 Cassell's Cyclopedia of Photography, Ed B.Jones, 1911, describes the Promenade Midget mount as 31⁄8 x 13⁄8 inches. 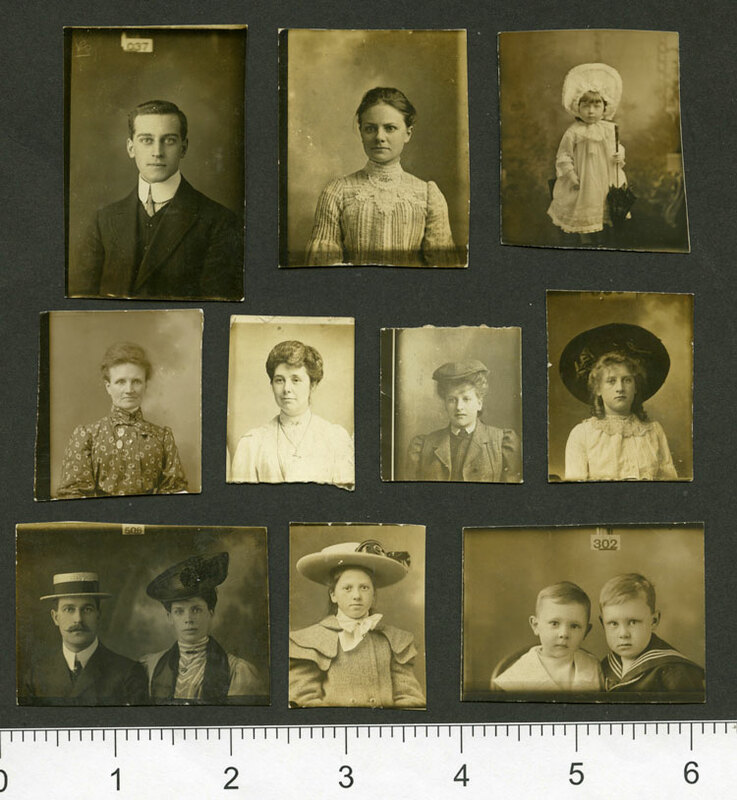 According to photo historian Peter Stubbs ( www.edinphoto.org.uk ), Minette photos measured about 1.5 ins x 2.5 ins mounted on cards 1.625 ins x 3 ins (broadly similar size and proportions to the ubiquitous cigarette card). Photo historian Jeremy Rowe (www.vintagephoto.com) gives the size of a minette carte as 1.5 x 2.38 in or 2 x 3.13 in. A search for the word "Minette" in the British Newspaper Archive does not provide a hit on a single photographer's advertisement mentioning this product. The variation in possible sizing and lack of advertising suggest that this must be a rather unusual product. The four photographs below could be Minettes from their sizing, but may not have been either labelled or sold as such. vignette of unknown girl, photographer unknown, unmounted, printed on photographic paper and dated 1932, 1.8 x 3.45 in. Below are four further examples, possibly Minettes, from one photographer, Morris and Co, 1 Denmark Street, Bristol. These are 1.75 x 3.25 inches and are printed on a glossy photo paper, unmounted, with the photographer's details impressed in the bottom border with a hand embossing machine. The well dressed subjects are unknown, the images are first class and have not deteriorated in any way over time. They date from around 1907-09. 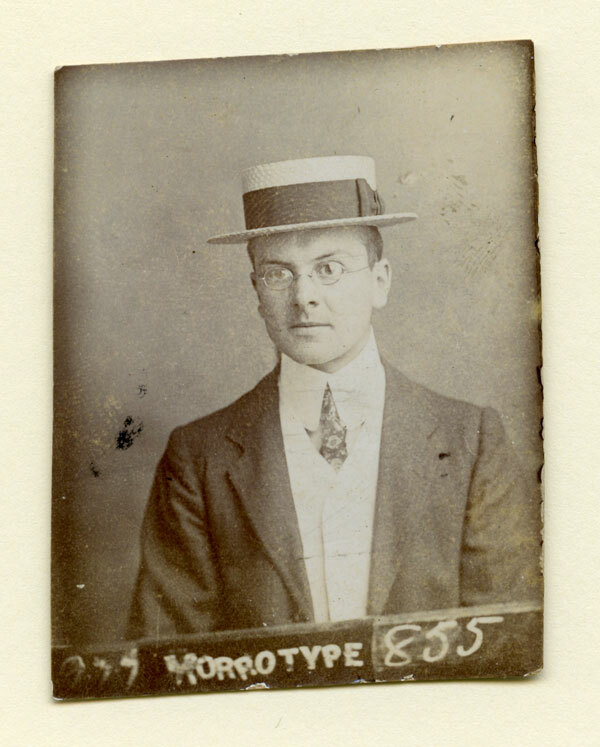 The first image below of an unknown man in a straw boater measures 1.6 x 2.05 inches, and has been inaccurately cut on a slant from a strip. Across the bottom of the strip is written "Morrotype" and a number 855. In the bottom left corner are some other numbers or letters which are indecipherable, but may be a partial date, best guess 1907. There is a similarity with a stickyback photograph, but this is slightly larger and does not seem to have had an adhesive back. It could be a contemporary copy, possibly an improvement, of the Stickyback. 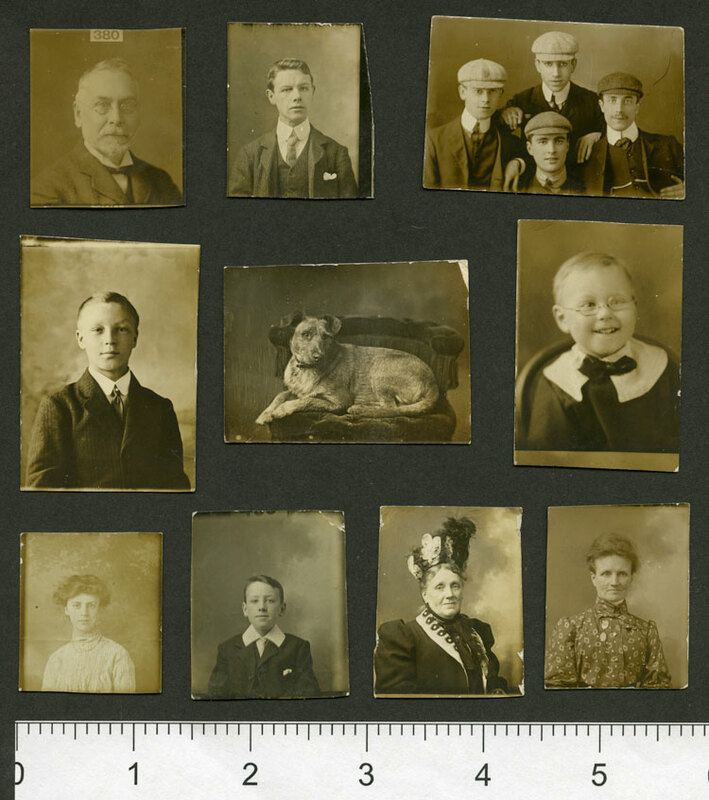 The second photograph is a Morrotype apparently dated 12 June 1905. This image is reproduced with the kind permission of the owner, Penny Guest, and shows her Great Uncle, Sam Stephenson, b. 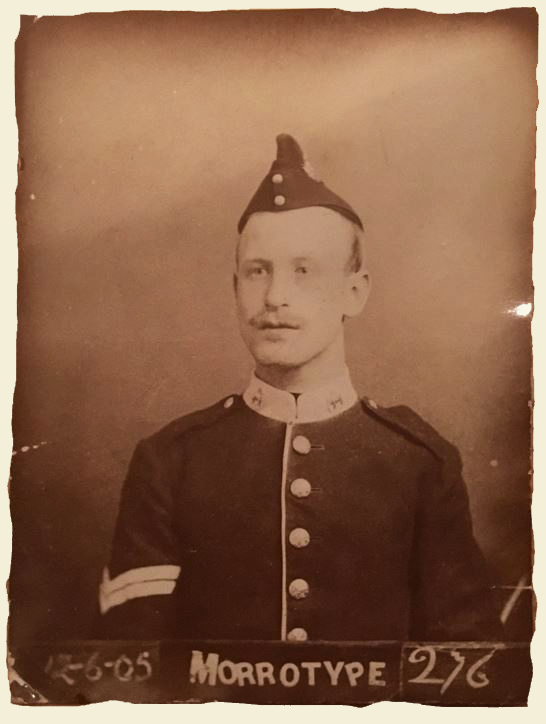 1881 who served in the Royal Marines Light Infantry and the Royal Navy Fleet Reserve. In 1905 Sam had connections with Halifax and Portsmouth, so it is possible that the Morrotypes were produced at one or other of these locations. On the other hand, the dress and demeanor of the other sitter suggests a possible seaside or holiday location. Presumably a photographer with the name of Morro, (or possibly Morrot), claimed this as his or her own invention. No obvious trace has yet been found of such a photographer in the British Newspaper Archive, 1901 and 1911 England census returns, UK Patents of the period, or trade directories of Yorkshire and Hampshire. 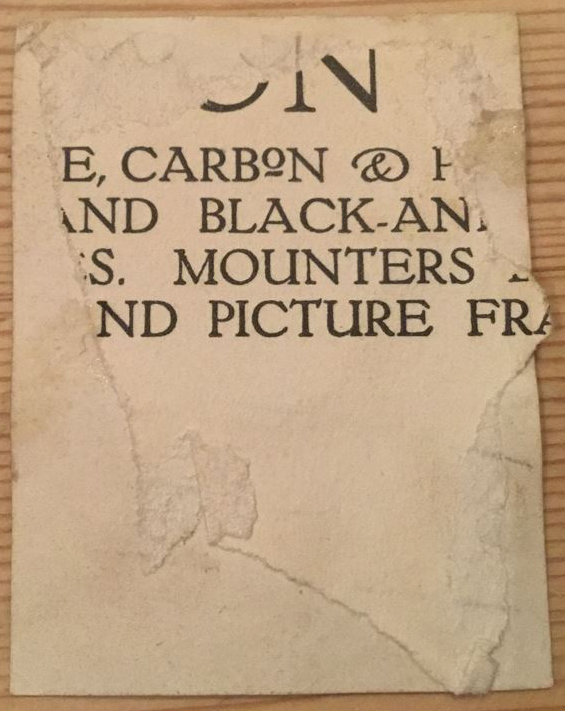 Below the two Morrotypes is the reverse of the 1905 image which has the remains of what might have been a photographer's or a picture framer's label - any suggestions as to its origin would be most gratefully received. These tiny little tintypes are usually presented in a little oval cut-out in a carte de visite sized mount. Often rather dark and murky in appearance, there are sometimes rust (oxidation) marks showing through the gummed paper sealing the metal plate onto the back of the mount. Below is an example with a festive greeting mount. For comparison purposes two other oval mounted photographs are shown - the tintype is on the left, photographer unknown. Below are three more examples of American Gem Tintypes. The one in the centre is in a mount with simple embossed decoration. There is a printed label on the reverse holding the tintype in position in the mount. 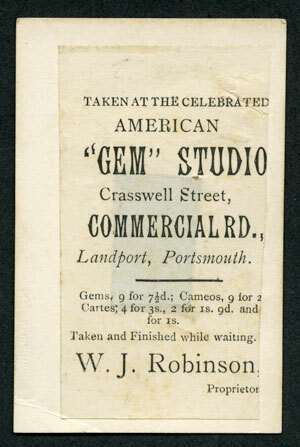 The label shows this to be by The American Gem Studio, Commercial Road, Landport, Portsmouth. According to the label they were selling Gem portraits nine for 7.5 pence. This studio was also offering "Cameos" and cartes de visite. 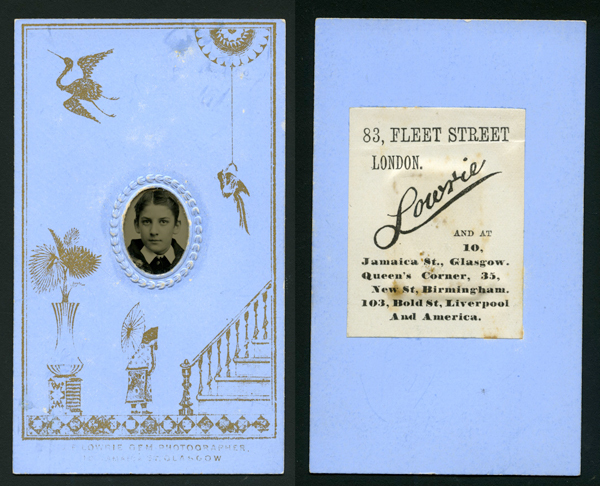 Next is a tiny tintype of a boy, on a pale blue embossed mount - on the face is the name of the photographer J.F.Lowrie 10 Jamaica St Glasgow. The tintype is held in position by a label listing Lowrie's other studios in Fleet St London, Birmingham, Liverpool and America. Tintypes were inexpensive to produce and were produced in many other sizes, mounted and unmounted. 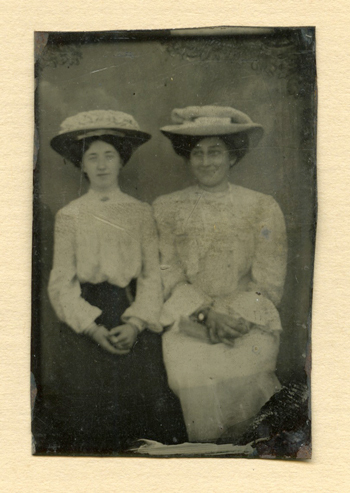 The example below, unmounted, measures 1 5/8 in x 2 1/2 in and shows two seated women in large hats, c.1900, photographer, location and subjects unknown. There must have been other mount sizes and products with specific names. The two cartes below for example are obviously on mounts by professional mount manufacturers and do not fit into any of the above descriptions. That on the left, on a cream mount, is by Hawke of Plymouth measures 4.25 x 2 inches. 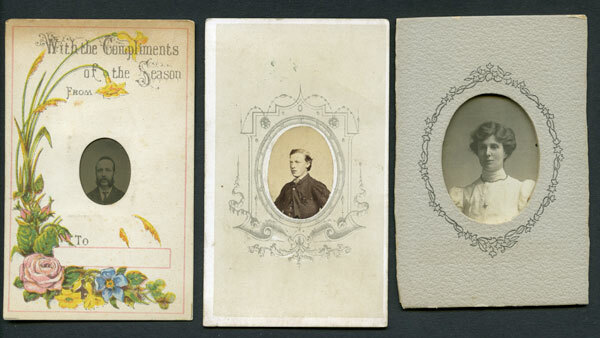 That on the right, photographer unknown, on green facing card, with maroon reverse and gilt chamfer edges has no information about the photographer and measures 3 x 2.25 inches. Both have blank reverse sides. Below is another, more economic version, of an existing photographic format. The postcard below is just 3 in x 4 in and depicts a teenage boy in shorts, the soft focus is probably due to subject movement. 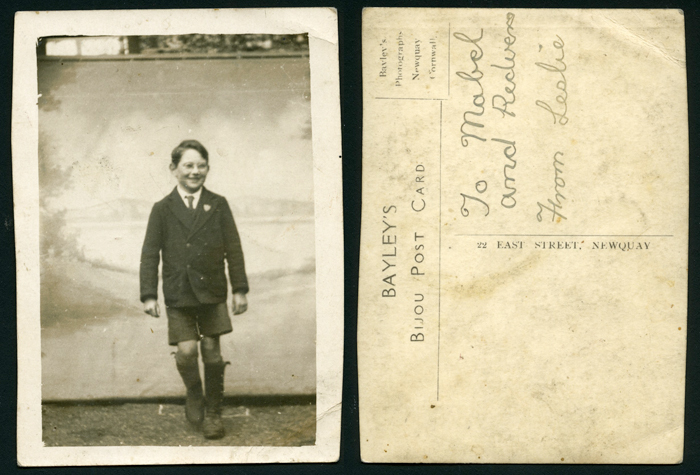 The reverse is a postcard back, with the title "Bayley's Bijou Post Card" and the address of Bayley's studio "22 East Street, Newquay". This is from the early 1930s. Bayley's Studio also did "Walking Pictures" in Newquay. Was the "Bijou Postcard" format an idiosyncracy peculiar to this studio, or was it in use more widely? 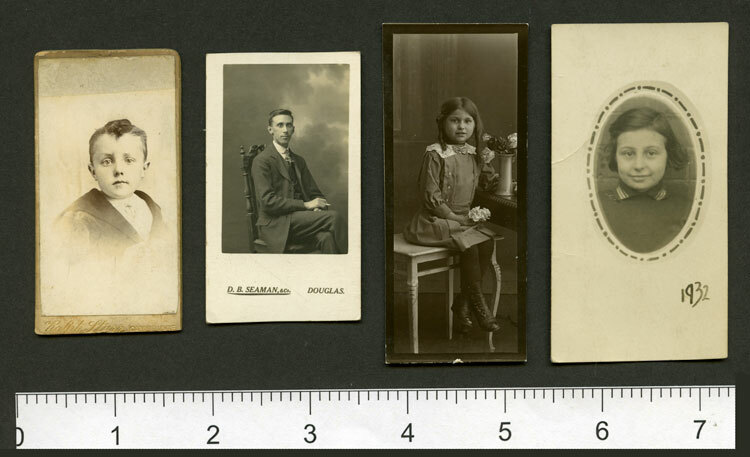 Once the various named formats of smaller portraits are taken into consideration, we have left a variety of tiny photographic portraits, generally un-mounted, examples of which are illustrated below. "In every collection there is a small amount of dross left in the bottom of the drawer - well here is mine! 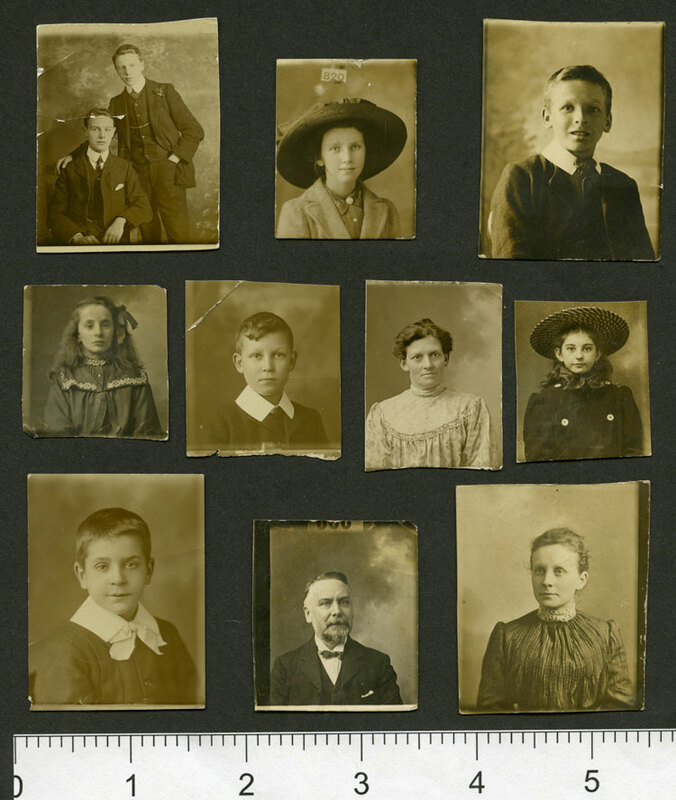 - I do not fully understand what they are, but they appear to be early 20th century, and from some sort of photo booth? they have numbers above their heads 302, 304. .... The small size of these (2 inches by 1 inch and a half) makes me wonder what they were for? Just a cheap format perhaps. [I am told that they were suitable for cutting up and putting in lockets]" He illustrated this page with just a few tiny portraits. (www.cartes.freeuk.com/small/small.htm) . “stickybacks and postcards .......class of business”.